The most recent building acquired by HeritageVillage is the Myers Schoolhouse, which was located at 370 Neeb Road in DelhiTownship. Built in 1891, the schoolhouse is named after Cornelius Myers, one of the first school trustees. Myers Schoolhouse operated for 35 years until Delhi decided to consolidate its school districts in 1926. The Myers schoolhouse was then closed and put up for auction. The school was purchased by Henry and Emma Backus and the family continued to use the property until the mid 1980’s. The school was used as a family party house and occasional community center until 1958 when Henry and Emma’s son, Harry, used the school as an interior decorating business. In 1986, the Backus family sold the schoolhouse to Charles & Pauline Johnson, who used it as a vision therapy office. In 1990, the Johnson’s sold the schoolhouse to the College of Mount St. Joseph. The schoolhouse was then renovated and used as a community reading center. 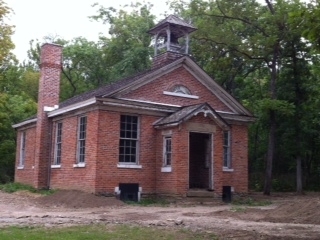 The schoolhouse was moved to HeritageVillage in 2009 and we are currently raising funding for its restoration. The first task to be completed is restoring the windows, which is scheduled to begin in March 2013.